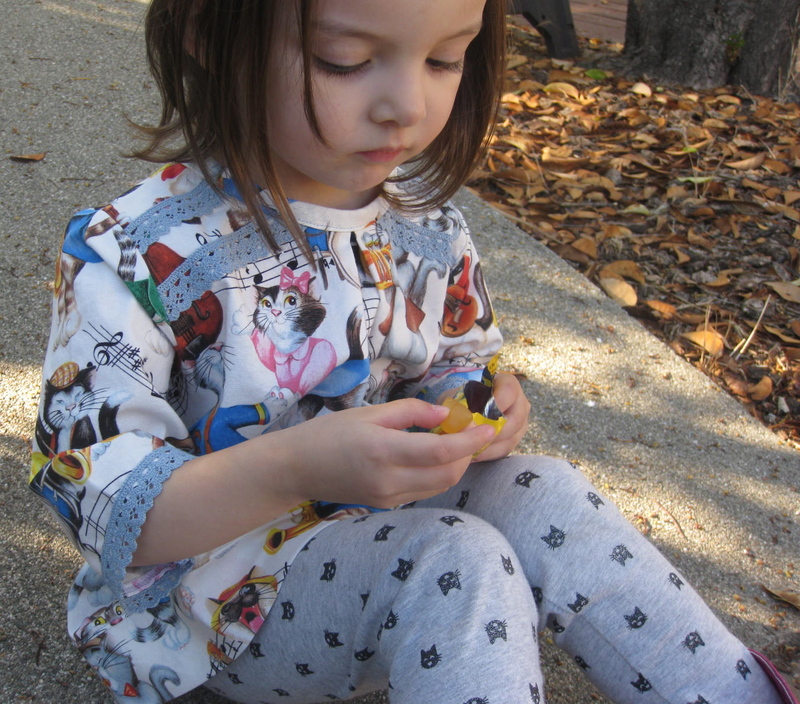 I’ve been wanting to make Craftiness is Not Optional‘s Lovebird Tunic for ages now. When I saw the Cat Lady Sewing Challenge on Miss Crayola Creepy, I thought this would be a great time to finally sew it up. 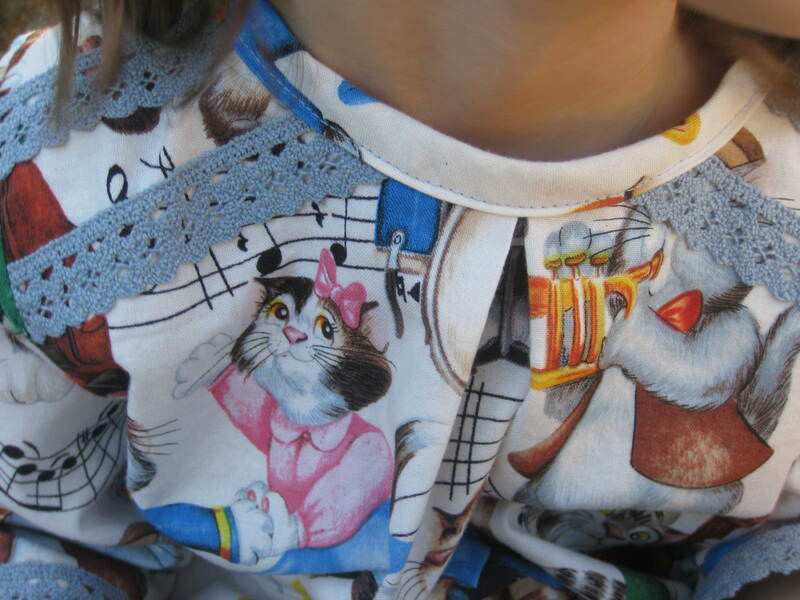 My daughter had been eyeing this Swing Cats fabric at our local fabric shop, but I just couldn’t get over how busy it was, so I would give some excuse as to why we couldn’t get it. She was so ecstatic that we were finally going for it that she carried/dragged the bolt to the cutting table. I added some blue lace trim and 3/4″ pleats. 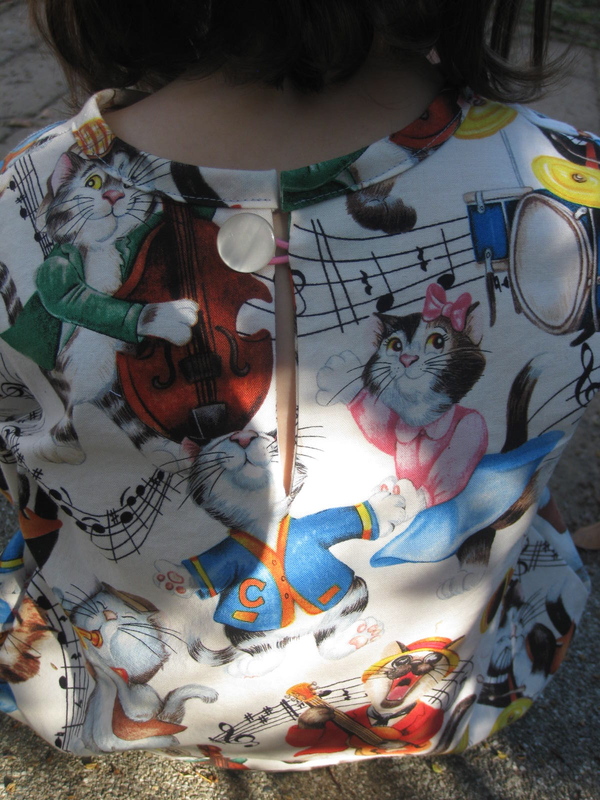 I made bias tape using the cat fabric, but it made for some very interesting matching up. Check out that green cat on the left. He’s got some interesting whisker/eye action goin’ on. Almost looks like really long winking lashes. I shall call him Winky! Anyway, I used a pink hair tie for the button elastic and a yellow button from my stash. The sleeve was too long in my original pattern. 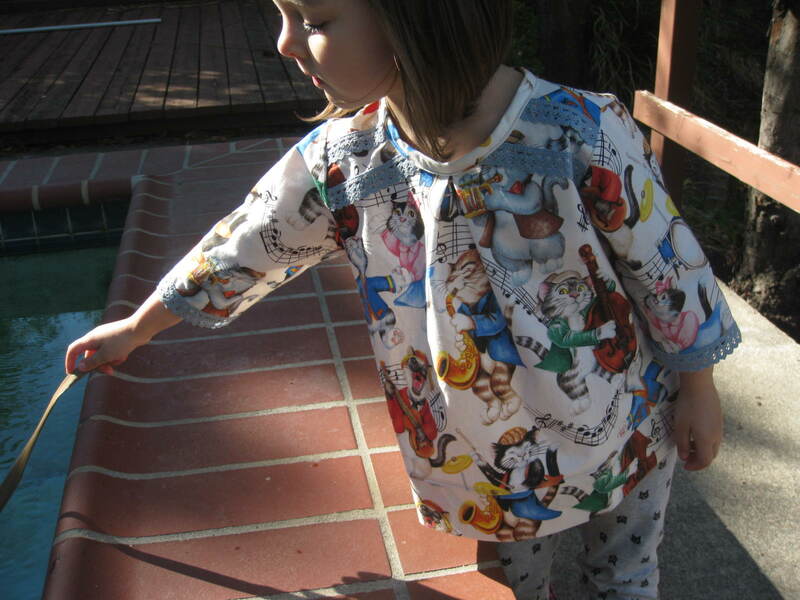 I drafted a size 4T with an 8.5″ sleeve, but I cut it back 2″ because this sleeve with trim didn’t look very good long. I think if I were to do this top over again, I would take the shoulder in at least 1/5″ or more. Here’s for some more weird match up. I decided to keep CINO’s “Happy mistake” and added the band at the bottom. I didn’t give much thought to how strange the pattern would match up (just look away, haha!). My girl doesn’t care at all, so I decided I won’t either. She insisted on wearing it right when I finished. 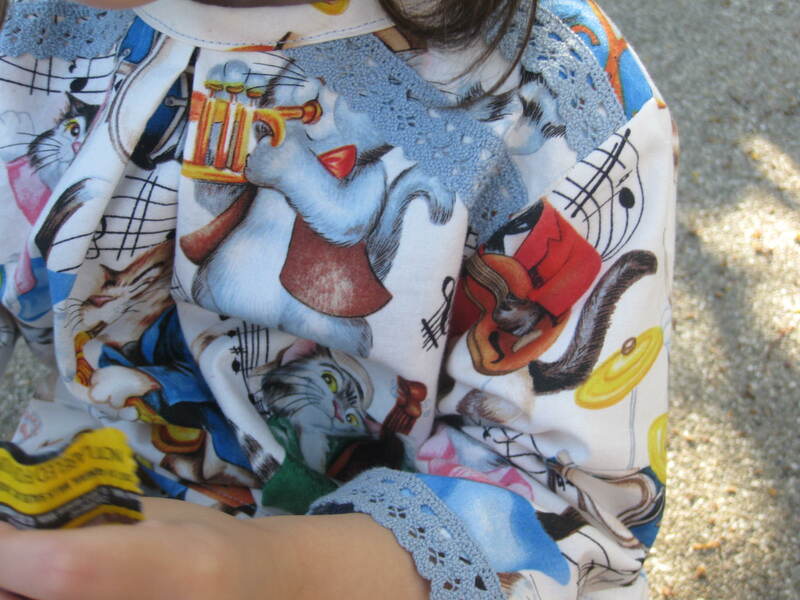 She was already wearing her cat pants, so I guess she matches! Funny thing was when I went through my stash, I found no less than 6 other cat prints. 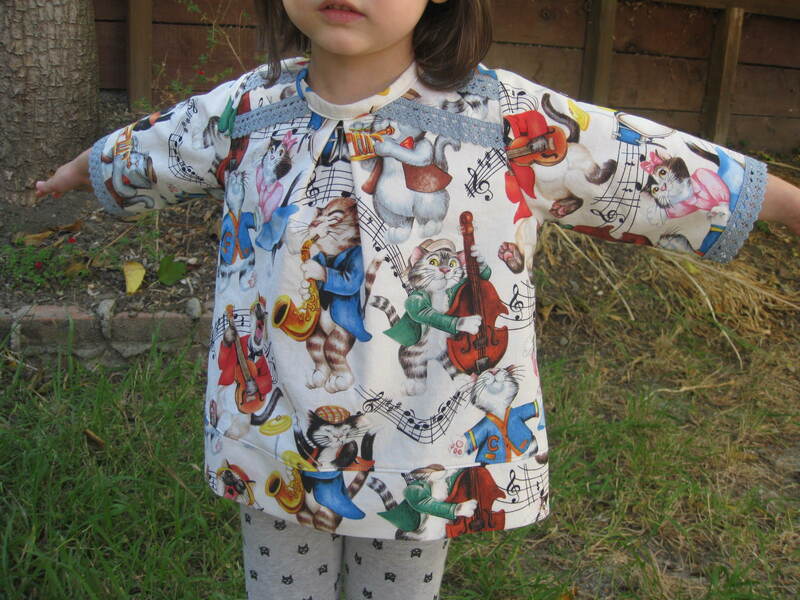 I had absolutely no idea I had so much fabric with cats on it! Soooo, more cat tops to come! Do you think she can have too many cat clothes? Is there such a thing? She says “Nahhh!”.